The standoff between the president and Congress that has led to a monthlong government shutdown has thrown DACA recipients in the middle of another round of political drama over immigration. She learned Saturday that a deal President Donald Trump offered congressional Democrats to reopen the government — and end a shutdown that has reached 32 days — would extend protections for her and hundreds of thousands of other undocumented youth, known as “dreamers,” for three years. In exchange, Trump wants Congress to approve $5.7 billion to build portions of a border wall — a demand that Democrats have flatly rejected. Then on Tuesday, Rodriguez learned that the U.S. Supreme Court decided not to take up a case brought by the administration to end the program once and for all. While the high court’s decision was welcome news to a DACA community that could have seen its protections end had the court decided to hear the case, the deal the president offered Democrats last weekend is nothing more than another bandage on a problem that needs a permanent fix, Rodriguez said. “It’s really not a deal; it’s just another Band-Aid that leaves a large community of people in a state of uncertainty, and that’s not what we need,” she said. DACA recipients have become used to this kind of limbo since Trump announced in September 2017 that he was ending the program within the next six months, Rodriguez said. At that time, the president said he was setting that deadline to give Congress time to come up with a permanent solution. Ten months after the deadline passed, DACA recipients are still waiting. Along with the extended protection for DACA recipients, the president’s offer included an extension of temporary protective status for some immigrants who have lived in the U.S. legally for years. The GOP-controlled U.S. Senate is expected to introduce proposals to reopen the government this week, although they aren't likely to pass the U.S. House, where Democrats assumed the majority this month. It means the staring contest between the president and Democrats will likely continue, leaving people like to Rodriguez left to wonder what's next. Some conservative groups are also criticizing the president's offer, a sign that although he’s sticking to his commitment to build a wall, Trump still could face a backlash from hardliners who insist extending protections for immigrants contradicts what he promised on the campaign trail before his 2016 election. As the situation plays out, the number of DACA recipients who benefit from the program has slowly declined. When the president announced he was ending the program, about 124,000 Texans had received DACA, according to federal statistics published at that time. The Migration Policy Institute estimates that the number of DACA recipients in Texas was about 115,000 as of August 2018. 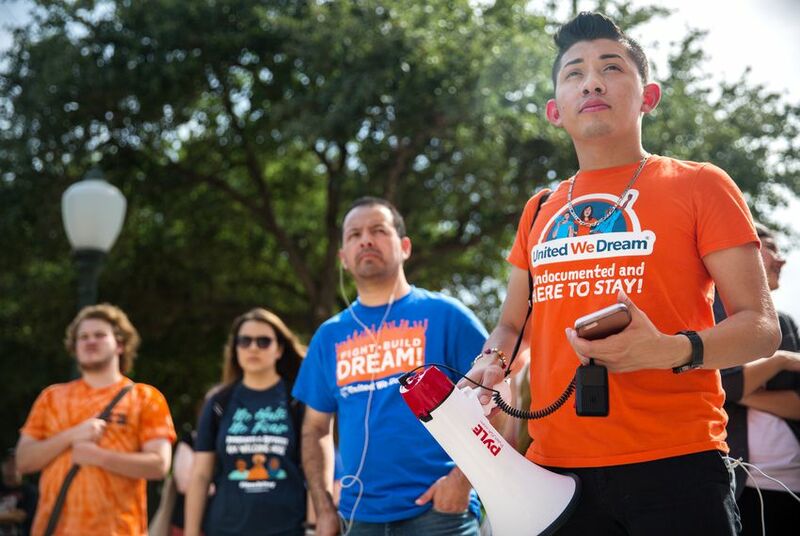 Zaira Garcia, the Texas director for FWD.us, an immigrant rights and criminal justice reform advocacy group, said the decline is probably due to the $495 reapplication fee and DACA recipients' fears about reapplying for the program. Although they submitted personal information in their original applications, Garcia said reapplying renews some of their original fears. “Some people are just scared to have their information out there,” she said. Garcia said the silver lining in the midst of the chaos is that the Supreme Court’s decision not to hear the DACA case could benefit the program's recipients. “It allows [the debate to continue] without a ticking time bomb. Now members of Congress can take their time to debate what is the correct piece of legislation to put out that will protect individuals long term or even permanently,” she said.